Le Figaro: Mr. President, the Americans and the French have accused you of perpetrating a chemical attack on the 21st of August in Ghouta, which led to the death of hundreds. Do you have evidence to suggest that your army did not launch the attack? President al-Assad: First of all, anyone making such an accusation is also responsible for providing the evidence to substantiate the allegation. We have challenged them to present a shred of legitimate evidence, which they have not been able to do. Since their foreign policy should be tailored to suit the interests of their own people, we have challenged them to present legitimate evidence to their own public opinion to substantiate their claims; again they have not done so. Secondly, where is the logic in us carrying out an attack of this nature: two years into the crisis I can confidently state that the situation on the ground is much better now than it was a year ago; how is it conceivable then that an army making significant advancements on the ground through conventional armament would resort to using weapons of mass destruction? I am neither confirming nor denying that we possess such weapons – this is not a matter for discussion. For the sake of argument, if the army had such weapons and decided to use them, is it conceivable that it would use them in areas where its own troops are deployed? Where is the logic in that? Additionally is it really plausible that the use of these weapons in a heavily populated area in the suburbs of the capital did not kill tens of thousands; these substances travel in the air. Le Figaro: Were soldiers from the Syrian Army injured by the weapons? President al-Assad: Yes, in the ‘Baharia’ area, in the suburbs of Damascus; the inspectors from the UN team met with them in hospital. Le Figaro: Some do acknowledge that there has been some advancement by the army on the ground; however in other areas the rebels have also advanced and you are looking to wipe them out. President al-Assad: Again, the areas in question are residential areas. The use of chemical weapons in these areas would result in the deaths of tens of thousands. All the accusations are based on unsubstantiated claims made by the terrorists and random pictures and videos posted on the Internet. Le Figaro: The Americans have stated that they have intercepted a telephone conversation between an executive in you inner circle and officers in the Army giving the order to use these weapons. President al-Assad: If the Americans, the French or the British had a single shred of evidence they would have disclosed it from day one. We will not contest rumours and dubious allegations; we will only discuss substantiated truths – if they have any, they should present them. Le Figaro: Is it possible that someone from your inner circle or officers in the Syrian Army took the decision without your knowledge? President al-Assad: Again – regardless of whether we do or do not possess such weapons, in any country that does possess these weapons, the decision to deploy is usually centralized. Either way, this is classified military information. Le Figaro: But this is what Jihad Makdissi stated. President al-Assad: No, at the time, Jihad said that should we possess these weapons, we would not use them. Whether we do or do not possess them is an entirely Syrian affair. Le Figaro: President Obama has postponed a military strike on Syria, how do you explain this? President al-Assad: Some have seen Obama as weak because of his decision to withdraw or delay a possible strike by days or weeks; by waging a war on Syria, others have seen him as a strong leader of a powerful country. From my perspective, power lies in your ability to prevent wars not in igniting them. Power comes from ones ability to stand up and acknowledge their mistakes; if Obama was strong, he would have stood up and said that there is no evidence that the Syrian government used chemical weapons, he would have stood up and said that the right way forward is to wait for the results of the UN investigations and work through the UN Security Council. However, as I see it, he is weak because he succumbed to internal pressure from small groups and threatened military action. As I said strong leaders are those who prevent wars not those who inflame them. Le Figaro: What do you say to members of congress whose vote will determine whether or not there will be any military action? President al-Assad: Before they vote, they should ask themselves a simple question: What have previous wars achieved for America, or even for Europe? What has the world achieved from the war in Libya and the spread of terrorism in its aftermath? What has the world achieved from the wars in Iraq and other places? What will the world achieve from supporting terrorism in Syria? Members of congress are entrusted to serve in the best interests of their country. Before they vote, they need to weigh up their decision in the interests of their own country. It is not in the interests of the US to perpetuate instability and extremism in the Middle East. It is not in their interests to continue – what George Bush started – spreading wars in the world. If they think logically and in the interests of their country, they will not find any benefits to these wars. However many of them they have not mastered the art of logic in their political decision-making. Le Figaro: How will you respond to these strikes, should they happen? President al-Assad: If we think of the Middle East as a barrel of explosives close to a fire that is coming ever closer, then it becomes clear that the issue is no longer contained to a Syrian response, but rather what will happen after the first strike. The architects of the war can define the first strike – in other words they can determine what they will do, but beyond that it is impossible for anyone to predict what will follow. Once the barrel explodes, everyone loses control; nobody can determine the outcome, however what is certain is the spread of chaos, wars and extremism in all its forms everywhere. Le Figaro: Is there a danger that it will spill into a regional conflict? President al-Assad: Of course, this is the first and most dangerous risk. The issue today is no longer just about Syria, but about a whole region that is interlinked, socially, politically and militarily; the resulting challenges are regional, not just Syrian. Le Figaro: So is it likely that Israel would be one of your targets? President al-Assad: You don’t really expect me to announce how we will respond?! It is not realistic that we would announce our plans, but as I said there are many players involved and narrowing the conversation to just one player diminishes the significance of what will happen. Le Figaro: What do you say to Jordan who is known to be training the rebels on the ground? What is at risk for Jordan should the strike occur in favour of the rebels and terrorists? President al-Assad: Our policy has always been to not export our problems to neighbouring countries. We have been striking the thousands of terrorists that have entered Syria via Jordan, and Jordan has announced that it would not provide a base for any military strikes against Syria. However, should we not succeed in fighting terrorism in Syria, we can only expect that it will spread to other countries along with the ensuing chaos and extremism. President al-Assad: We have said this before and we have communicated this to them directly and indirectly. I believe Jordan is fully aware of the situation, despite the pressure on it to continue to be a route for this terrorism. As for Erdogan, I don’t think he has a clue of what he is doing. Our priority is to fight terrorism within Syria. Le Figaro: How will your allies – Hezbollah and Iran – respond to any strike? Are you counting on their support should you be attacked? President al-Assad: I do not wish to speak on their behalf, their statements have been very clear. We are all aware that this is a regional issue and as such it is impossible to separate the interests of Syria, Iran, Hezbollah and other countries that are supporting us. Today, stability in the region depends on the situation in Syria; Russia fully fathoms this. Russia is neither defending the President nor Syria, but rather it is defending stability in this region knowing all too well that otherwise it will also be affected. To assess the situation through the narrow lens of a Syrian-Iranian alliance is a naïve and over simplistic view; we are dealing with a situation of far greater significance. Le Figaro: Have the Russians reassured you that they will reach out to the Americans to try to attenuate the strike? President al-Assad: I don’t think anyone can trust the Americans; I don’t think there is a country in the world that can guarantee that the Americans will or will not take any form of action towards another country, so it is pointless to look for such reassurances. The Americans adopt one position in the morning, only to endorse the complete opposite in the evening. As long as the US does not comply with or listen to the UN, we should not be reassured. Le Figaro: How can we stop the war, the crisis in Syria has been on going for more than two-and-half years? You have suggested a National Unity government, the international community has suggested Geneva II, how can we stop the blood bath in Syria? President al-Assad: Discussing a solution at the beginning of the crisis is very different to discussing it today. From the beginning I have emphasised that a resolution can only be achieved through dialogue, which would lead to solutions that can be implemented through political measures. The situation today is different; today we are fighting terrorists, 80-90% of them affiliated to Al-Qaeda. These terrorists are not interested in reform, or politics, or legislations. The only way to deal with the terrorists is to strike them; only then can we talk about political steps. So in response to your question, the solution today lies in stopping the influx of terrorists into Syria and stopping the financial, military or any other support they receive. Le Figaro: Who is supporting them? President al-Assad: Primarily Saudi Arabia, followed by Turkey and Jordan by streaming the militants into Syria, as well as France, America and Britain. Le Figaro: Do you have proof that France has provided arms to the terrorists? President al-Assad: It is evident enough through France’s political stance and its provocative role in the situation as dictated to it by Qatar and other countries. Le Figaro: Mr. President, are you willing to invite the opposition to come to Syria, to guarantee their safety in order for you all to sit around a table and find a solution? President al-Assad: In January of this year we launched an initiative that addresses the points you raised and others in order to move forward with a political solution. However, this opposition that you refer to was manufactured abroad – manufactured by Qatar, France and others – it is not a Syrian opposition, and as such it takes orders from its masters who have forbidden it from engaging with this initiative. In addition to the fact that since they were manufactured abroad they lack local public support. Despite all their shortfalls, we did invite them but they did not respond. Le Figaro: However some did not respond for fear of their security, they fear being imprisoned like Abdul Aziz al-Khayer. Can you provide them with guarantees? President al-Assad: We have provided guarantees and I have spoken of these political points including guarantees of security to any member of the opposition wanting to come to Syria for the purpose of dialogue. However, they were either not willing to come or maybe they weren’t given permission to come. We have not killed or captured any member of the opposition. Abdul Aziz al-Khayer’s friends are all in Syria – you can see for yourself. Why would we target one of them and ignore the rest? Where is the logic in that? Le Figaro: How do you explain the French position towards you today, you were once friends with Sarkozy and you enjoyed a friendly relationship with France and visited several times? How do you explain this U-turn? President al-Assad: It wasn’t a friendly relationship. It was clear from the beginning that France, at the request of the Americans, was trying to manipulate Syrian policy. Even the positive shift towards Syria in 2008 was due to Qatari influence, and so was the negative U-turn in 2011. It is very clear that French policy towards Syria is entirely based on American and Qatari desires. Le Figaro: French Parliamentarians will meet on Wednesday. There is a big debate in France now, with some believing that Hollande has gone too far on this issue. What is your message to the French Parliamentarians before they convene and vote on the strike? President al-Assad: A few days ago the French Interior Minister was quoted as saying that “France’s participation is dependent on the US congress,” with no mention to the French Parliament. Allow me then to pose this question to you: To whom does the French government answer to – the French parliament or the US congress? Since 2003, on the back of the invasion of Iraq and its earlier position before the war, France has relinquished its independence and has become a part of American foreign policy. This applies to Chirac after the war on Iraq, to Sarkozy, and today to Hollande. So the question really is: will the meeting of the French parliamentarians return the independence of France’s decisions back to the French? We hope that this would be the case. Since they will be working in the interests of France, will the representatives of the French people take the side of extremism and terrorism? Will they support those who perpetrated the September 11 attacks in New York, or those who bombed the Metro in Spain? Will the representatives of the French people support those who killed the innocents in France? How is it possible for them to stand against individuals like Mohammed Merah in France and yet support others like him in Syria? How can France fight terrorism in Mali and support it in Syria? Will France adopt the American model of double standards? How can the parliamentarians convince the French public that their country is secular, yet at the same time it supports extremism and sectarianism in other parts of the world? How can France advocate for democracy but yet one of its closest allies – Saudi Arabia – is still living in medieval times? My message to the French Parliamentarians is: go back to the principles of the French Revolution that the whole world is proud of: Liberty, Justice, Equality. Le Figaro: You cited French national interests; if France intervened militarily, would their interests in Syria or the region be targeted? President al-Assad: I do not know if your interests will be targeted or not, this will depend on the consequences of the war. But most certainly, France will lose its interests. There is hatred and contempt towards French policy, which would inevitably directly affect French interests in the region. In addition, unlike previous times, significant countries in the region have started to look away from Europe towards the East for alternative partnerships where there is mutual respect between countries. Le Figaro: So you are calling out for rationality and reason? 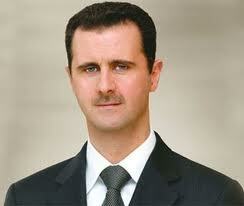 President al-Assad: For rationality and ethics. Le Figaro: Are you planning to run for office in the next presidential elections? President al-Assad: This really depends on the will of the Syrian people at the time. If I feel that there is a strong public desire for to me to run, I will not hesitate and vice versa. We may not have accurate measures at the moment, but we do have strong indications. The strongest indicator is that when you are fighting terrorists from over 80 countries who are supported by Western and Arab states, if your people do not embrace you, you simply cannot carry on. Syria has been resilient for two-and-a-half years this is an important indication of strong public support. Le Figaro: Mr. President how much are you prepared to fight in this crisis? President al-Assad: We have two options: we either defend our country against terrorism or we surrender. The history in this region has never known surrender; it has seen many wars, yet it has never and will never surrender. Le Figaro: So will fight and sacrifice your life for Syria? President al-Assad: When it becomes a matter of patriotism, we will all fight to defend our country – whether we are citizens or the president, it is not about the individual but rather about the whole nation. What is the point in living if your country is dead? Le Figaro: Mr. President, do you take responsibility for the mistakes that have been committed including those by the army and the security forces? Do you accept that mistakes have been made? President al-Assad: Any human being makes mistakes in their work. If you do not make mistakes you are either not human or you do not work. I am a human being and I work. However, when you want to evaluate your mistakes you need to do so in hindsight when the events are behind you and you are able to see the results of your actions. We are currently in the heart of the battle; when it is over, we can assess the results and determine whether we were right or wrong on particular matters. Le Figaro: Are you confident of winning the battle? President al-Assad: The history of our region teaches us that when our people defend themselves, they inevitably win. This is not a war against the President or the Government alone, it is a war against the entire country, and we shall be victorious. Le Figaro: Having said this, your army has lost control over certain areas in the North, East and South. Do you believe that you can regain these areas? President al-Assad: The issue is not about labeling areas as being under our control or under the control of the militants; there isn’t a single area that the army has planned to enter and not been able to do so. The real challenge is the continuous influx of terrorists from across the borders and the acts they have perpetrated at a social level in the areas they have infiltrated. Le Figaro: Moratinos, a previous friend of yours, told me few days ago that he cannot understand what is in Bashar al-Assad’s mind, how could he possibly commit such violence in his country. President al-Assad: There is an analogy that can also be asked here: how could France allow the killing of the terrorists who terrified French citizens? How did the British deal with the riots in Britain last year? Why was the army deployed in Los Angeles in the nineties? Why are other countries allowed to fight terrorism and Syria isn’t? Why is it forbidden for Mohammed Merah to stay alive in France and to kill civilians and yet terrorists are allowed to remain alive in Syria and kill innocent people? Le Figaro: Mr. President, how has your daily routine changed in terms of leading the country since the beginning of the crisis? Some suggest that after two-and-a-half years Bashar al-Assad is leading the country alone. President al-Assad: This is what I meant earlier, if the West is against me and so were the Syrian people, if I was alone, how could I conceivably be leading the country? This is illogical. I can continue to lead because of the strength of public support and the strength of the Syrian state. Unfortunately, those in the West do not view this reality objectively. Le Figaro: Mr. President, a number of French journalists have been held in Syria. Do you have any idea of their situation? Are the Syrian authorities holding them? President al-Assad: Do you mean that we are holding them? Le Figaro: They were taken hostage in the North of Syria; do you have information on their fate? President al-Assad: If they were taken hostage by the terrorists, you will have to ask them. If anyone is arrested by the government for entering the country illegally, they will be taken to court rather than being held in jail. They would face charges according to Syrian law and this would be public knowledge. Le Figaro: Are you looking to cooperate with France on security issues? This was an area that went well in the past. President al-Assad: Any cooperation, be it security, military or economic requires political consensus. You cannot maintain security cooperation with any country when there is a conflict of interests. Le Figaro: When your father passed away, you visited France and were received by President Chirac. Everyone viewed you as a youthful and promising president and a successful ophthalmologist. Today, since the crisis, this image has changed. To what extent have you as a person changed? President al-Assad: The more imperative question is: has the nature of this person changed? The media can manipulate a person’s image at a whim, yet my reality remains the same. I belong to the Syrian people; I defend their interests and independence and will not succumb to external pressure. I cooperate with others in a way that promotes my country’s interests. This is what was never properly understood; they assumed that they could easily influence a young president, that if I had studied in the West I would lose my original culture. This is such a naïve and shallow attitude. I have not changed; they are the ones who wished to identify me differently at the beginning. They need to accept the image of a Syrian president who embraces his country’s independence. Le Figaro: Has France become an enemy of Syria? President al-Assad: All those who support the terrorists financially or militarily are enemies of the Syrian people. Anyone who facilitates the killing of a Syrian soldier, or works against the interests of Syria and her people is an enemy of Syria. I am not referring to the French people since I believe that the French government is working against the interests and will of its people. There is a difference between the concepts of adverse government and adverse nation. The French people are not our enemy but the policy of their government is one that is adverse to the Syrian people. Le Figaro: Is the French government an enemy of Syria? President al-Assad: The more adverse the policies of the French government are to the Syrian people, the more the government is an enemy to the Syrian people. The current policies, that we mentioned earlier, adopted by the French leadership are hostile towards Syria. This hostility can only end when the French government readdresses its policies.